Smog is caused by chemical reactions involving volatile organic chemicals and nitrogen oxides that take place in the presence of sunlight. These pollutants can come from a variety of sources, but in urban areas, a large quantity usually comes from motor vehicles. These are the reasons that smog often becomes a bigger problem when there is heavy traffic and lots of sunlight. 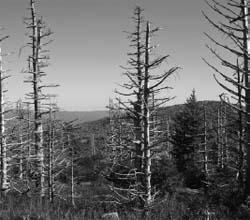 Trees and other plants are seen here, damaged or killed by acid rain. Acid rain results when water in the atmosphere combines with chemicals like sulfur dioxide, acidifying rainwater.